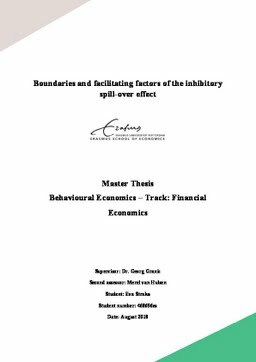 This thesis contributes to the existing literature on self-control by investigating the inhibitory spill-over effect. This effect predicts that engaging in one intentional act of inhibition control, makes the execution of additional, simultaneous acts of self-control easier. In addition to that, potential boundaries of the effect as well as facilitating conditions were analysed by introducing an appetizing stimulus and examining whether differences in the inhibitory spill-over between participants were depending on trait self-control measured by participants’ score on a self-control index. The data for this analysis was obtained through a field experiment conducted in Austria, the design of which was based on previous research on self-control. The results of this study do not indicate a significant effect of the deliberate act of self-control on other self-control tasks and therefore no further evidence of the inhibitory spill-over effect is found. Moreover, the addition of a tempting stimulus does not cause a significant change in individuals’ self-control. Also, there are no significant differences in the sensitivity to the spill-over between people of high-self-control and low self-control.